The newly refurbished apartment (840 sq. ft.) is located in a former farmhouse in Reinerzau and offers everything you need to enjoy a relaxing time as couple or with your entire family. Children are very welcome. The large living room and dining area with comfortable couch and armchair provides all possibilities for a relaxing come together with your loved ones. In addition to the existing digital television, a DVD/CD player and internet can be provided. 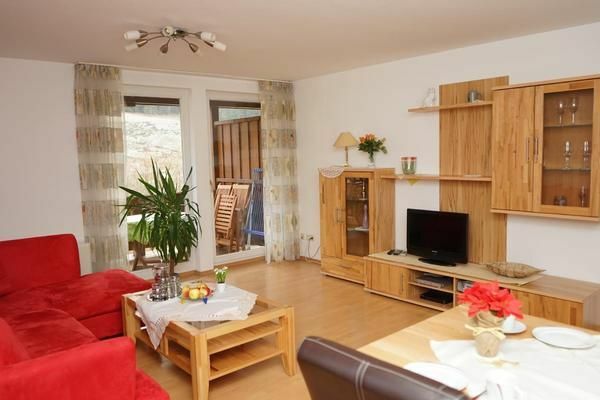 The apartment offers two large bedrooms with double bed and wardrobe. If necessary, the couch in the living room can be expanded to an extra bed for 2 people. The kitchen is fully equipped with fridge and freezer, oven, microwave, dishwasher, toaster, coffee maker, egg cooker, electric kettle and all other necessary cooking and dining utensils. Additionally, a spacious bathroom (including hairdryer), as well as a storage room for luggage complement our apartments. The large balcony is equipped with seating furniture for up to 4 people, so you can have breakfast in the morning sun in a cozy atmosphere outside. If necessary, high chair is available for your little ones. Bed linen and towels are also provided during your stay. Please give notice in advance. The KONUS guest card, which is included in your tourist tax, allows you to use all public transport for free in the Black Forest. The apartment is a non-smoking apartment. Thus, it is permitted to smoke on the balcony. Visitor's tax: per person and day Costs amounting to 1.03 EUR (Mandatory).